When will people understand that percentage increases are confusing to some people? It doesn't double it, it triples it. Note that this is a trait, not an ability. It's in the same category as the situational boosts in Snow and against Ogres and the like. I've gotten 300+ Garrison Resources off one mission before. Get this trait on as many followers as possible. You can never have too much GR; if you think you have too much, just wait until you're trying to upgrade buildings to level 3. I got 500 garrison resources using two followers with scavenger on a level 100 mission, so it does stack but it is additive not multiplicative. e.g. base reward 100 resources so each person with scavenger gave +200. if you are picking the Scavenger trait from inn selection, it's wise to choose the second ability wisely. The other trait you should have along with this on the same follower isn't so much (trying to get) every type of Ability counter on several Scavengers or guessing which one is more frequent; there is a key Trait that significantly enhances the success rate of all of these missions: Burst of Power. In my experience, it will give you 70%-80% chance, the same as matching the Type of an enemy on a mission (while an Ability that counters directly goes to 100% if the follower level is close enough). Apparently there are no Garrison Resources missions longer than 7h, and even the longer ones (6h) are for groups only. So what you'll want to do then is to use another important trait: Epic Mount (stacks with itself, so even 6h missions with room for 3 followers will go down to 2h). Combinations of these 3 Traits are what you should be going for. Choose one once a week at the Inn/Tavern or level characters with one of them, and hope to get another of these Traits when moving to rare or epic quality. They can be very useful in missions of any level. Also note, that you will still have 1 Ability, or 2 if it's epic, to counter with on a Scavenger+Burst of Power follower, so they'll still have the same opportunity to give you 100% chance sometimes! And the higher level they are compared to the mission, the better chance it will be as well, so if you prioritize them for XP missions whenever possible, you'll soon get great results. It's recommended to start leveling such a follower before you actually need to use those Garrison Resources, to give it enough time to return your investment and then some. Why having a few followers with Scavenger is nice. Deadly Minions　0　0　0　0　←Dont recruit scavenger follower that counters this ! I have 20 followers and not a single one has Scavenger yet. How do I get this perk or trait? Am I doing something wrong? This "Party Buff" stacks. If you send more than one follower with the trait on the mission, you'll get the 200% extra from each member of the team (on a 2 or 3 person mission). E.g. 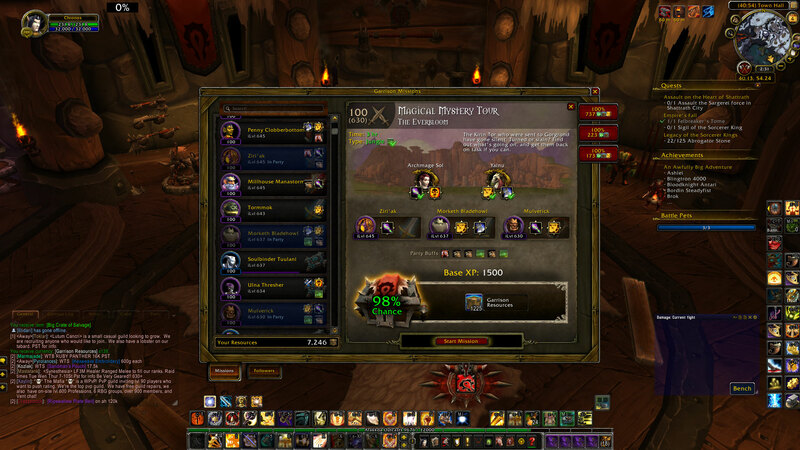 Griefing with the Enemy is 130 resources for a ilvl 615 level 100 mission. With one follower with Scavenger you are awarded 390 resources (The base 130 plus the 200% increase is another 130 + 130). With 2 Scavengers you get 650 (the base 130, plus the two 200% of 130 + 130 + 130 + 130). And we three, you'd get another 260 extra totaling 910. On a higher level (iLvl 630) mission like Magical Mystery Tour your 175 resources can end up being 1225 resources (currently the highest amount you can get in a single mission atm). Check the list of garrison missions that reward resources if you're curious what other combinations exist. The goblin in me makes this my favorite Trait! For those of you leveling alts, buy the L2 Inn design using Outpost Building Assembly Notes rewarded from the Gorgrond outpost quest chain. You will probably be at 7-11 followers, and week after week all your alts will be getting a new Scavenger follower. Once you hit the 20/25 limit, you will be able to stack Scavs in 2-3 party resource missions. Prioritize leveling your Scavs to 100, then epic, and weap/armor upgrades. Then off to level 96 for Salvage building quest chain in Arak. Then buy the L2 for gold. Other possibilities are to reroll followers with abilities you are in excess of... in hopes of also getting the Scavenger trait.. When you're done with the Inn, replace Inn with Trading Post to sell off excess resources as your Scav army will be pulling in hundreds of resources a day. In addition to what abilities your scavenger hero comes with, they also each have a unique class and spec, each with its own set of 5 possible abilities. Assuming you plan on leveling this follower to epic, they will learn another ability. If the ability that they currently know is less than their calculated average effectiveness on GR missions per ability, then they're likely to learn a better ability when they reach epic. Especially if they're a highly ranked class. If you're unsure of a follower's class/spec, go here to find out what they are. So for each spec, I compared the five abilities each spec can learn, and calculated the average number of 90-99 and 100 Garrison Resource (GR) missions their abilities counter in order to rank each spec based on how effective its abilities are for Garrison Resource missions. If the total 90-99 + 100 GR missions are tied, the tie was split by the higher number of 90-99 missions countered. And now, here is the full list. Scavenger is nerfed in 6.1 to a maximum of 100% increase. Increases the garrison resources gained from a mission by 100%.